What is a Whistleblower and How are Whistleblowers Legally Protected? On behalf of Admin of JML Law, A Professional Law Corporation posted in Whistleblower on Friday, Aug 31 2018. A whistleblower reports or participates in an investigation setting forth information that he or she has reasonable cause to believe such information discloses an employer’s violation of or non-compliance with federal and local laws, rules and regulations, or unsafe working conditions or practices. An employee who refuses to participate in an employer’s activity that violates or does not comply with federal and local laws, rules, and regulations is also considered a whistleblower and afforded whistleblower protections. We know being a whistleblower takes courage. Taking a stand against an employer’s illegal or non-complying activities and practices can have serious repercussions if the employer decides to retaliate against the whistleblower by harming his or her employment. That’s where whistleblower protections come in; under California State and federal law, employers may not retaliate against whistleblowers. 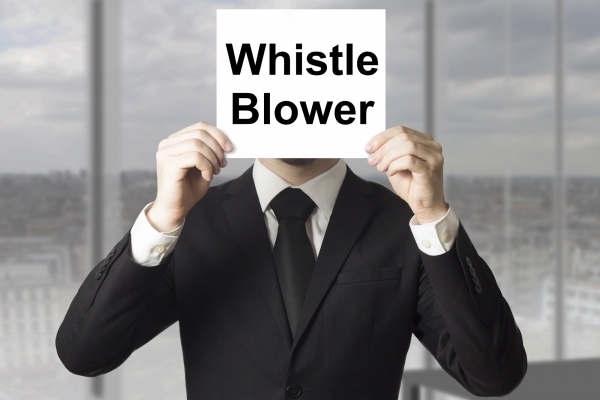 To put it simply, whistleblowers are generally covered by federal and state labor laws that prohibit an employer from taking actions that negatively impact a whistleblower’s employment. The State of California has taken measures to make sure that whistleblowers are protected from retaliatory employers and recent California whistleblower cases suggest that juries want to protect whistleblowers too. See below for details of several recent whistleblower cases. 3/27/18 Jimmy Saxton vs. Hip Hop Beverage Corp. et al. An employee claimed he was fired because he complained of racial harassment. 6/6/18 Debra Loveless vs. Kaiser Foundation Health Plan, Inc.
HR employee claimed she was fired for trying to strengthen EEO investigations department. 4/24/17 Steven Babyak vs. Cardiovascular Systems Inc.
An employee claimed he was fired for raising concerns about patients as well as employer’s legal violations. How do you prove whistleblower retaliation? Compensation can include financial compensation for lost wages, interest on lost wages, lost future wages, and punitive damages. Punitive damages can be awarded if an officer, director, or managing agent’s conduct was done with malice, oppression, or fraud. In addition to financial recovery, awards may include employment reinstatement, directive to remove negative reports in employment file, and requirement that employer posts a notice acknowledging the retaliation. Contact our Riverside whistleblower lawyer, if you believe you have been retaliated against for being a whistleblower. If your livelihood has been threatened or harmed because you spoke out against your employer’s illegal or non-complying activities, our attorneys will help to see that you are compensated for your damages.